Strong start to earnings season… the worst place for Julian Assange’s trial… salt in the wound at tax time… and more! That’s it. We’ve reached peak lunacy for the entire post-2008 economic expansion. After the market close yesterday, Uber made its much-awaited IPO filing public. 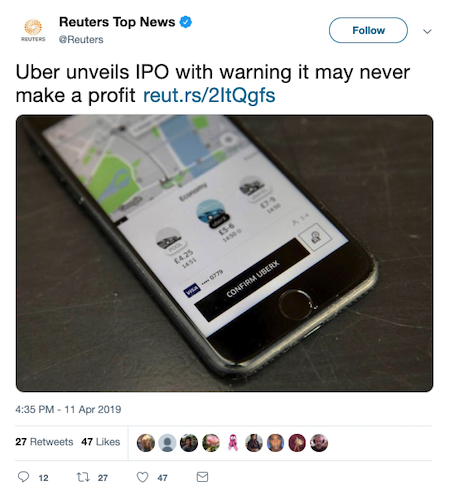 Uber is “constantly losing money, and its capital-raising strategy is a Ponzi scheme,” said the Australian wealth manager Hamish Douglass in 2017. Mr. Douglass was one of two financial renegades we profiled that year who were calling BS on Uber. Hey, if the business world’s allegedly best and brightest investors are willing to pour money down a rathole, why not retail investors too! Douglass lays 99% odds of Uber going bankrupt by 2027. Sounds about right. Program note: After a week of heavy topics in The 5 — Trump and the Fed, the new tax law, IPO valuations, alleged job losses from automation, to say nothing of Julian Assange — we’re taking it easy going into the weekend. This weekend is bringing a huge tax windfall to a select group of wealthy property owners. Under Section 280(A) of the tax code, the expenses of owning your primary residence are not tax-deductible — aside from mortgage interest and property taxes. But if you own rental property, most of your ownership expenses are deductible — which goes a long way toward reducing the taxes from your rental income. Augustans tend to skip town during Masters week to avoid the crush of people. Many of them rent out their homes while they’re away. A five-bedroom house close to the golf course can generate a quick $10,000, tax-free. Hmmm… It occurs to us this arrangement could work out handily even if you’re not well-heeled but you live in a big college football town. Six weekends every autumn, and the income is tax-free? Boom. 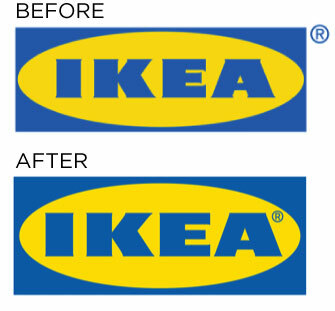 Adventures in corporate rebranding: Take a look at Ikea’s old logo on the top… and its new and improved logo on the bottom. No difference, you say, other than moving the registered-trademark symbol inside the oval? Yeah, that’s what I thought too. But apparently I lack keen powers of observation… and an appreciation for the considerable efforts of a Stockholm-based design firm called the Seventy Agency. The Swiss government has just set off a minor disturbance in the global coffee market. As you might know, the Swiss are rigorously well-prepared to fend off foreign invasion. Among other measures, young men who complete the compulsory military service are then expected to keep their military-issue firearm at home. In the years after World War I, Switzerland implemented an “Ordinance on the Compulsory Storage of Foodstuff and Animal Feed” — a stockpile of essential goods just in case the worst were to happen. You know, like World War II. As of 2022, however, coffee will no longer be considered an essential good. “Coffee contains almost no calories and therefore does not make any contribution to food security from a nutritional point of view,” says a statement issued Wednesday by the Federal Office for National Economic Supply. As a practical consequence, Nestle and 14 other importers, roasters and retailers would no longer be required to store bags of raw coffee. The markets today, you wonder? Sanguine on this first day of earnings season. JPMorgan Chase delivered a big earnings “beat,” as did Wells Fargo. Meanwhile there’s merger news in the energy sector: Chevron is shelling out $33 billion to buy Anadarko Petroleum. APC shares are up 32% as we write. The major stock indexes are all in the green, with the Dow leading the way. The Big Board is up nearly three-quarters of a percent as we write at 26,329. Still, even if that gain sticks, the Dow will end the week slightly in the red. Gold is licking its wounds after yesterday’s latest smackdown at $1,294. Crude is back above $64 a barrel — a level that’s going to make it mighty difficult for the Trump administration to tighten its embargo on Iranian oil exports. Last year, Washington imposed sweeping sanctions on Iran’s oil sector — aiming to reduce its exports to zero. The sanctions were set to take effect in November. But when crunch time came, the White House granted six-month waivers to most of Iran’s biggest crude customers — including the biggest by far, China. In the end, Team Trump decided a full-on embargo would drive prices too high for American fuel consumers. Those six-month waivers are set to expire next month. At this stage, it looks as if they’ll be renewed for five of the eight countries — including China. 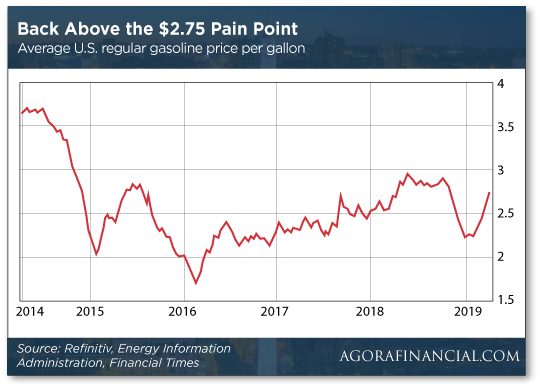 Little wonder: This morning AAA says the average national price for a gallon of regular unleaded is $2.81 — up 8 cents in a week. Last year, respondents to a AAA survey said $2.75 was the pain point at which 20% of drivers would either drive less or cut back on other expenses. The national average crossed that threshold again last week. For another 40% of drivers, the point of no return is $3. Citigroup issued a report yesterday saying that’s entirely plausible this summer. The West Coast states are already there, and many Californians are paying over $4. Iranian oil exports are down from this time a year ago, for sure… but the drop has gone as far as it can unless Washington wants to incur the wrath of the American driving public. “On Assange,” writes a Platinum Reserve member, “it’s obvious that the media ignore the threats to freedom of the press because they figure that ‘they’ will never be subject to any negative consequences, since they’re in bed with swamp creatures in the DOJ and Congress. The 5: Many mainstream reporters are performing intellectual gymnastics so they can declare Assange’s actions to be somehow different from those used by their own organizations. Trevor Timm from the Freedom of the Press Foundation isn’t buying it. “While the Trump administration has so far not attempted to explicitly declare the act of publishing illegal, a core part of its argument would criminalize many common journalist-source interactions that reporters rely on all the time. And forget about a fair trial whenever Assange is extradited. Not given where the feds brought the case. “No national security defendant has ever won a case in the Eastern District of Virginia,” says CIA whistleblower John Kiriakou — who was prosecuted there and wound up doing two years in the federal pen. This week during a podcast interview with our acquaintance Scott Horton, Kiriakou described how his lawyers brought in a phenomenally successful jury consultant — one who’d helped win acquittals for O.J. Simpson, William Kennedy Smith and George Zimmerman. “Though most, if not all, of your readers would understand the basic math associated with tax liabilities, withholding and refunds, the virtue signaling exhortations on the subject grow tiresome,” a reader writes in response to yesterday’s mailbag. “Are we who pay attention so wrapped in our own perspectives that we can’t appreciate the thought process of the Judge Judy crowd? Reality check: Many filers knowingly overwithhold as a forced saving program, knowing that they lack the discipline to save on a paycheck-to-paycheck basis and look forward to the lump sum each spring. Of course there are more financially savvy moves than interest-free loans to the government, but why judge? The 5: Washington reserves the authority to change the rules at any time and with no warning. It’s why your editor is personally leery of Roth IRAs despite their purported advantages. And yes, the House Ways and Means Committee recently cleared legislation that would prohibit the IRS from setting up a free electronic tax filing system. P.S. Disney shares are screaming higher today — up 10% as traders love the newly revealed details about new the Disney+ streaming service set to debut in November. With that, Mike Burnick urged readers of his premium advisory Amplified Income to unload their DIS call options for a one-day gain of 300%. Yes, there’s more where that came from. You can get started with Mike’s trades by placing a simple three-minute phone call. Details here.